Cold weather can prevent even seasoned exercisers from getting the daily recommended 60 minutes of physical activity. And without the drive to keep going, you can easily take the winter off. 1) Take walks, but bundle up. Walking or running in cold weather is safe, but you should take precautions to stay warm and dry. Check the weather report to ensure there is no ice or snow, and avoid going outside if there is a wind chill warning in effect. Dress in layers, avoid cotton and make sure your extremities are covered—wear a hat, earmuffs, gloves and adequate socks. Most importantly, stay hydrated. You do not have to have a home gym to take advantage of exercise at home. You can do aerobic and muscle strengthening in your living room—there are many online videos that can help you learn and follow along. If you have stairs in your home, they are a great way to get cardiovascular exercise. Get creative and create a custom at-home fitness routine that works for you. Visit a nearby ice skating rink to enjoy the season and burn calories. Even ice skating at a moderate speed for an hour can burn more than 300 calories. It’s a great way to get in some winter weather exercise, and you can make it social by inviting friends or family. 4) Participate in indoor sports. Contact a local indoor sports center to learn about their winter programs. Most communities have indoor intramural leagues and other fitness programs from indoor volleyball to dance classes. 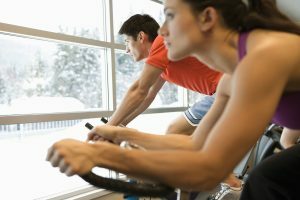 Many people also choose to join a gym during the winter months so they have a variety of indoor exercise options. Before beginning any type of fitness program, it’s important to speak with your primary care provider about the exercise regimen that’s best for you.